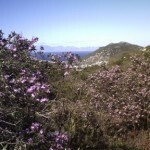 This is one of the easiest mountain walks on the cape because you park at one of the highest points of the walk. Don’t think that this is just a flat, boring trudge though, you are still going to go up and down some hills, but they are gentle slopes as opposed to knee wrenching cliffs. You will also go through some varied terrain without ever going on anything other than well worn paths, and the views are breathtaking. The walk begins at the parking area at the top of Black Hill. I have parked here many times without any problems, however, with all isolated car parks in South Africa, take precautions. Don’t have anything on show that has any value to it, in fact, don’t have anything of value in the car at all- I think though that the high volume of traffic on the road is a deterrent to the casual criminal. The path slopes up and then turns to the right, following the contour of the hill: in periods of heavy rain there can be a large puddle across the path, but the wonderful folks at Table Mountain National Parks have put stepping stones in to stop your feet from getting wet. One word of warning here- if you are walking with your dogs, keep them in sight and your leads close. This is a path used frequently by horses, even though it seems too narrow to me. You have little choice but to stand in the bushes to let them by. After a few hundred meters the path joins the jeep trail. Turn left up the hill. The path climbs steadily for about a kilometer: you will pass two paths that go off to the left, at right angles. The first takes you up into the rocks to your left, eventually dropping down into the horse farm in Glencairn; the second drops you down the hill towards the stream and braai area in Welcome Glen (this is a nice walk, especially when the stream is in full flood, until you try and come back up, only to discover how steep this slope is, especially if slippery from rain). Ignore both these and carry on until you get to the third, which is more a fork than a turn off. This path is the most distinct of the three and even has paving slabs for the first few meters (see photo). This is a good time to take a breather and enjoy your first panorama. You will now have come well clear of the rocky peak that was to your left, opening up a glorious view down the Glencairn valley towards False Bay, and on a clear day, Pringle Bay in the distance. The path enters a small ravine, which is one of my favorite places to visit. There is a stream in the bottom of the ravine which supports a huge variety of life. If you like sugar birds then you will have found heaven, if you like wild flowers then you will have found heaven, if you like tranquility you will have found heaven. At certain times of the year the ravine has a wonderful fragrance to it, which at times borders on sedation. 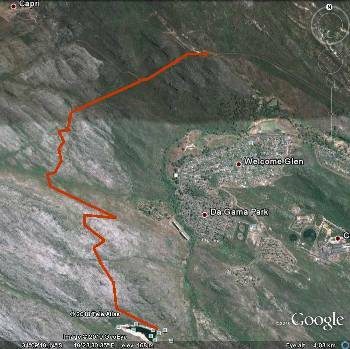 After crossing the stream the path climbs out of the ravine up onto a plateau, running parallel to the Sololei game reserve fence. It is amazing how much cooler it feels up there after the closeness of the ravine. A few hundred meters on the path rejoins the jeep track, turn left. A few years ago this area was devastated by wild fires. I went there just after and was confronted by a wasteland of charcoal and scorched carapaces. 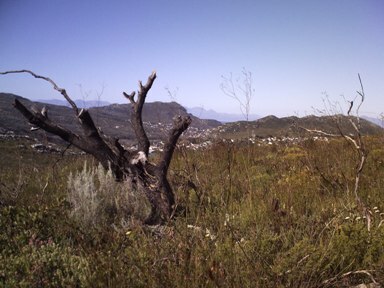 It is amazing to see how quickly the fynbos recovers from these events, it is virtually impossible to tell that anything happened at all, except maybe that you see less tortoises. The track snakes down into the bottom of a wide valley: just keep to the track and you won’t go wrong, there are a number of smaller paths that lead of in different directions but ignore them. At the bottom you will cross a bridge, made of poles, and begin the steady climb up the far side of the valley. Vistas begin to open up again; by the time you reach the top of this hill you will have panoramas all the way from Chapman’s to Pringle Bay, all the way around to Simon’s Berg. 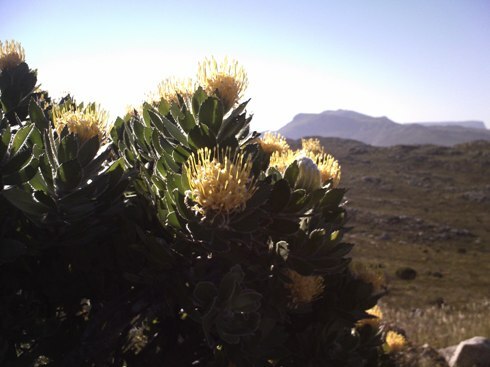 When I was there last week the Suikerbosse proteas were in full flower, in all there yellow magnificence. It is one of the most photogenic sights in nature, the bright yellow flowers against an azure blue sky. I am always amazed by the ever changing colors of the mountains of the Cape. 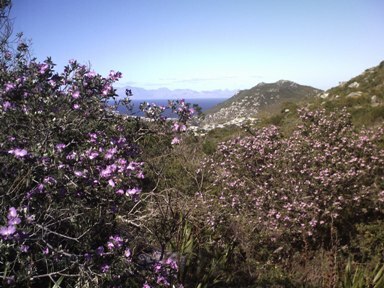 At certain times of the year, as different flowers bloom, the fynbos can change color on a weekly basis. The track eventually begins to drop down towards the dam, which you should see down to your right. Water levels vary according to the seasons: it can be as high as a few meters from the top of the wall to nearly empty. The first time that I visited the dam was in the middle of summer when the water level was very low. I returned in the spring and wondered where all the rocks had gone to; in fact the water level gets so high that you virtually step off the path into the water. You have two choices with this walk. Either you return back along the way you came, or you do the walk with friends and employ the two car system- it really depends on how far you want to walk. Either way, make sure that you enjoy the tranquility of the dam before you move on; if you are really lucky you might even get to see the local baboons playing on the dam wall. Hi there, I read your page regarding your hikes to Lewis Gay Dam. I am not an experienced hiker and quite unfit at the moment, but I am very interested in doing this route because I live really near and I’ve heard it’s pretty easy. I wanted to know how far the dam is from the Blackhill gate entrance? i’ve heard it’s 3 hours. Is that 3 hours in total or 1.5 hours there and 1.5 back? Also, you spoke about employing the two-car system. If one opts for the shorter route back, where does one land up? I am asking so I can organize transport to collect us there after the hike. Many thanks for getting in touch, I’m always happy to help anyone get more enjoyment out of our beautiful surroundings. Blackhill to Lewis Gay is probably the best mountain walk on the peninsula to start out with, there are some up hills, but no massively sharp climbs, or knee jarring descents. As for the time frame, I am not too sure: I am a fast walker and don’t keep too close an eye on what time I start or finish. I should say that 3 hours there and back for someone who is admitting to unfitness would be a stretch; but three hours one way would be a dawdle for anyone. That said, this walk can throw up all sorts of things that can cause you to pause, baboons are a regular sight, especially at the dam and you will probably be tripping up over tortoises. Doing the two car system on this walk avoids the return along the same path, however, you are parking the cars in two isolated locations, and these days you never know, so if you can arrange a drop off and a pick up it is better. 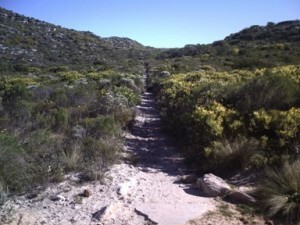 The road to the Lewis Gay dam is via a turn off just above Redhill in Simon’s Town, though, if I was doing this one way and someone was picking me up at the end, I would add the walk down the road to the main road, as it is very interesting, and has a number of ruined buildings that you can wonder at. If you enjoy that walk you can try your feet on a number of other easy gradient walks on the peninsula. 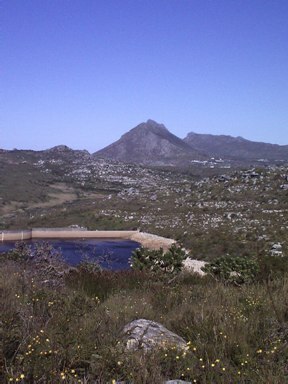 Piers Cave from the Ou Kaapse Weg side is fairly flat with only a few rocky scrambles; Sunbird valley has a circular walk which is nearly flat; and a little further up is Constantia Nek which is a classic contour path. 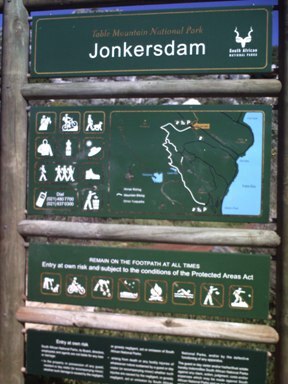 Could you tell me if dogs are allowed on this hike – I read somewhere that they are not allowed in the Sololei game reserve but it seems that this hike does not go into the reserve? Hi Mary- There is a sign on the border of Sololei game reserve that says that dogs will be shot! I don’t know who would carry this out now since the place went bankrupt, but, still… This walk only follows the border of Sololei, there is a route, along the bridal path, which does go into the reserve, but the valley path avoids this. Its a well maintained turn off the bridal path and hard to miss. There are probably fish of some kind or another in the dams, but whether they are worth fishing for (and whether you are allowed) is another matter. I certainly doubt that there are trout in there.